I'm happy to say it is time to give my basil plants a haircut. This has been a very good year for herb growing. All of my basil plants are doing very well and I couldn't be more delighted. I recently used up the last of my frozen basil from last year's harvest so I have been waiting patiently for the time when I could make my first batch of pesto this season. Pesto has become a staple in my freezer. Once you get used to having it on hand you never want to be without. It works for appetizers and main dishes and is a flavorful condiment to perk up an otherwise ordinary sandwich. Freezing my basil in individual cubes makes it very easy to keep them on hand. Pesto is a versatile condiment to keep on hand. 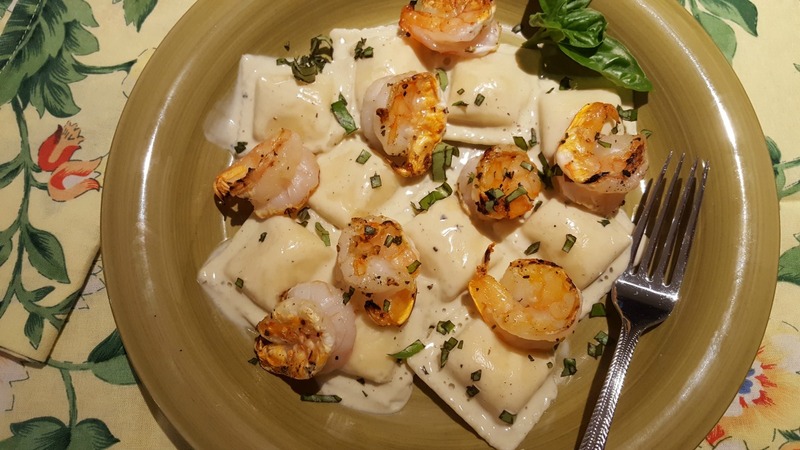 It is a delicious way to jazz up a simple pasta dish. I love to add it to bread crumbs to make a special beef tenderloin dinner. We love, love, love pesto as a spread for freshly baked foccacia bread. 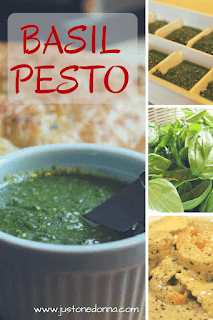 I use pesto so often that I make sure to stock my freezer with my summer bounty of homemade pesto for year round use. Quantities are approximate. Use this recipe as a guide. A little more or less of anything just makes the resulting pesto more yours. No two batches of my pesto are ever the same. 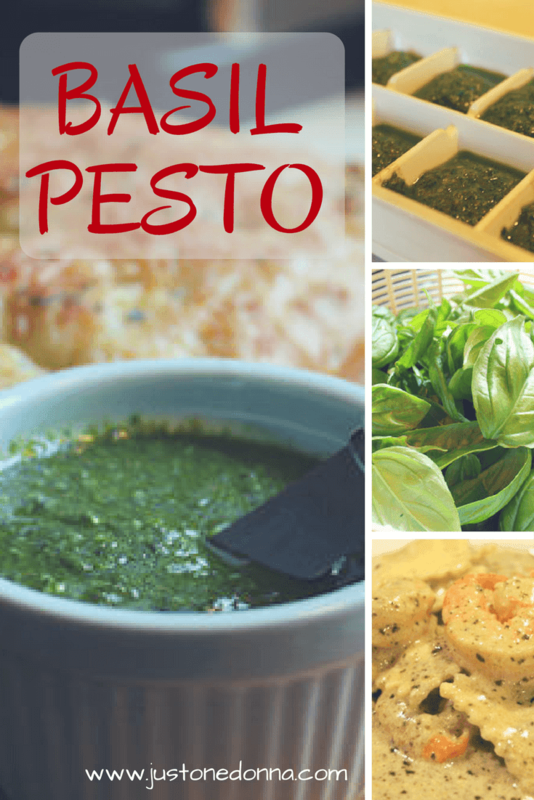 While pesto is traditionally made with basil you can experiment with other herbs and leafy green vegetables as well. For example, try kale like this recipe from The Perfect Pantry. When you don't have pine nuts, substitute walnuts or almonds. You can substitute Pecorino Romano cheese in place of or along with Parmesan cheese. Use what you have. Pick the leaves off your basil, wash and spin dry. Toast the pine nuts in a dry skillet over medium heat. Watch them carefully because you want them to be lightly browned, not burned. Remove them from the heat when you start to smell their nutty aroma. Place the basil, pine nuts, garlic, and a couple of tablespoons of olive oil in the bowl of your food processor or blender. Process until it forms a paste. Drizzle the remaining olive oil into the paste while the machine is running. Stop the machine, add the cheese, and process to blend together. Taste and add salt and fresh ground black pepper as needed. Tip: To freeze your pesto, fill the individual sections of an ice cube tray with pesto. Place in your freezer until frozen. Remove the cubes from the tray and package in zip closure freezer bags for longer term storage. We enjoyed our pesto with some homemade focaccia bread. Oh, baby, was that ever tasty! You'll also love your homemade pesto in this Shrimp Pesto Alfredo recipe. My husband has been asking for pesto lately. When we lived in Idaho, I would purchase it from a sweet Italian lady who made her own. Now I am in Texas, and don't know anyone who makes fresh pesto, so I need to start making my own. Thanks for the recipe! I know exactly what you mean, Susan. There is nothing like fresh. I'm so happy my basil is doing so well this year. It looks like I'll have plenty to freeze. The other thing I like about making my own is that I can customize it to our tastes. I hope you'll make some, too.